On Tuesday last - despite the money-wasting fruitless shenanigans of the main opposition party - Canadian Finance Minister Bill Morneau delivered the government's 2019-20 budget. A whopping 464-page doorstop which intuitively says it's about anything but transparency. I have not read all of it, only the portions which appear relevant to climate change and by extension, electric vehicles. (Fortunately, the search function in PDF tools lets one home in on key phrases and words quickly, better than the table of contents.) What there was didn't take long to read. Just 11 pages of the 464, and most of that tangents and fluff. Pages 83 to 93 in https://www.budget.gc.ca/2019/docs/plan/budget-2019-en.pdf if you want to see for yourself. So let me reproduce the interesting bits - it won't take long. "To expand the network of zero-emission vehicle charging and refuelling stations, Budget 2019 proposes to build on previous investments by providing Natural Resources Canada with $130 million over five years, starting in 2019–20, to deploy new recharging and refuelling stations in workplaces, public parking spots, commercial and multi-unit residential buildings, and remote locations." That statement would be more reassuring if the government's current programs in this space were functional in terms of delivering 'the network of zero-emission vehicle charging and refuelling stations'. Natural gas is NOT a zero-emissions transportation fuel. Period. Hydrogen vehicles are a little trickier. Hydrogen combustion vehicles are not zero-emissions. Hydrogen fuel cell vehicles emit water vapour, which most climate science acknowledges to be a greenhouse gas (GHG). So, calling them 'zero-emissions' requires a bit of work on definitions. The Electric Vehicle Infrastructure Demonstration (EVID) program which closed to applications in early February 2018, has not yet pushed a dollar out the door - more than a year later. The Electric Vehicle and Alternative Fuel Infrastructure Deployment Initiative (EVAFID) program has delivered more dollars to natural gas and hydrogen filling stations than to electric vehicle charging stations. Don't take my word for it, look at the government's list of EVAFID awards yourself. It's another fossil fuel subsidy program masquerading as a carbon reduction program. A hydrogen filling station does not know if the vehicle at the pump is a hydrogen combustion vehicle or a hydrogen fuel cell vehicle. If I did the addition correctly, that's $6,502,000 (45%) for natural gas (a GHG 56 times more potent than carbon dioxide), $3,000,000 (21%) for hydrogen (made mostly from natural gas in Canada today), and $4,967,000 (34%) for charging stations for electric and plug-in hybrid vehicles. Yes, even the 'electric car' charging stations provide a benefit to some vehicles that burn gasoline. (E.g. the Mitsubishi Outlander PHEV, despite its small battery, has a fast-charge connector as standard equipment.) The program the federal government promotes as being for zero-emissions electric vehicles puts 66% of its funds into infrastructure that actual 'zero-emissions' electric vehicles cannot use. If the ratio holds, that's another $87 million plus for the fossil fuel industry of the proposed $130 million. "Meeting the ambitious sales targets requires automakers to make sufficient models and numbers of zero-emission vehicles available for sale to meet Canadian needs. Budget 2019 proposes to provide $5 million over five years, starting in 2019–20 to Transport Canada to work with auto manufacturers to secure voluntary zero-emission vehicle sales targets to ensure that vehicle supply meets increased demand." "To encourage more Canadians to buy zero-emission vehicles, Budget 2019 proposes to provide $300 million over three years, starting in 2019–20, to Transport Canada to introduce a new federal purchase incentive of up to $5,000 for electric battery or hydrogen fuel cell vehicles with a manufacturer’s suggested retail price of less than $45,000. Program details to follow." $300 million over 3 years is $100 million a year. At $5000 per vehicle (maximum), that's a cap of 20,000 vehicles a year. That's simply not good enough, if we are serious about reducing GHG emissions. It is definitely not going to induce an electric vehicle industry to spring up in Canada. It's half the existing incentive in Donald Trump's U.S. But the killer line is: Program details to follow. It is unique in my experience with federal budgets to see a program announced with a fixed sunset date, but an unknown start date. My biggest problem with this vague incentive is that it is going to hurt Canadian car sales for the next few months - not just electric car sales (which it will kill almost completely except in the luxury segment). Canadians have not seen a rise in real incomes since Harper took power. Most are earning less - in real, inflation-adjusted terms - than they did over a decade ago. (Per the 2016 census, median total household income rose by 10.8% from 2005 to 2015. Inflation rose by 20% during the same period (you have to do some math with the data shown here). So, our average household is making about 10% less in real terms than a decade ago (incomes did not keep up with inflation in 2016-2018 either). And they have an older car - which they likely still need and have not been able to afford to replace for some time - so, an incentive to buy a new car - electric or other - is going to be of interest, especially if we're shopping in the sub-$45,000 price range, where $5,000 represents more than 10% of the sticker price. "To attract and support new high-quality, job-creating investments in zero-emission vehicle manufacturing in Canada, automotive manufacturers and parts suppliers can access funding through the Strategic Innovation Fund, which was recently provided $800 million in additional funding through the 2018 Fall Economic Statement." Well, that 2018 strategy certainly didn't induce GM to keep the Oshawa car plant open as part of their plan to shift to electric vehicles (that's going to happen in other countries, including the U.S.). The only mass-production electric being built in Canada today is the plug-in hybrid Chrysler Pacifica, which doesn't qualify for the purchase incentive because it's a hybrid and because the price is well above $45,000. Maybe it will help Magna, who has done a lot of the grunt work on the Smart Fortwo electric 2-seater, which creates some good jobs in France. "To further support businesses’ adoption of zero-emission vehicles, Budget 2019 proposes that these vehicles be eligible for a full tax write-off in the year they are put in use. Qualifying vehicles will include electric battery, plug-in hybrid (with a battery capacity of at least 15 kWh) or hydrogen fuel cell vehicles, including light-, medium- and heavy-duty vehicles purchased by a business. This will encourage all businesses to convert to zero-emission fleets and leave more money to be invested in other productive ways. For example, a taxi company or a school bus operator will be able to recoup their investments in eligible zero-emission vehicles in a faster manner. "Immediate expensing will apply to eligible vehicles purchased on or after March 19, 2019 and before January 1, 2024. Capital costs for eligible zero-emission passenger vehicles will be deductible up to a limit of $55,000 plus sales tax. This is higher than the capital cost limit of $30,000 plus sales tax that currently applies to passenger vehicles. This new $55,000 capital cost limit reflects the comparably higher cost of zero-emission vehicles and will be reviewed annually to ensure that it remains appropriate as market prices evolve over time." Well, at least the made-in-Canada Chrysler Pacifica qualifies here with its 16 kWh battery. The Chevrolet Volt (16.5 kWh) also qualifies, though it is being discontinued (and not made in Canada). The Mitsubishi Outlander PHEV, Toyota Prius Prime, all the Ford plug-in hybrids, the Hyundai Ioniq plug-in hybrid, the Hyundai Kona plug-in hybrid, the Kia Niro plug-in hybrid ... are left out in the cold with battery capacities of less than 15 kWh. And we know when this incentive will begin (last Tuesday), and how much it is worth. The budget also noted the 2009 G20 commitment to "to phase out ... inefficient fossil fuel subsidies" by 2025. Not mentioned in the budget is last year's $4.5 billion purchase of an oil pipeline courtesy of Canadian taxpayers. Or the continuing tilting of the playing field (e.g. by allowing the NEB to approve more pipelines without considering climate change or the most significant of environmental damage expected if such pipelines are built). Or that the government doesn't actually even know how many programs it has which provide subsidies to the fossil fuel industry, or how much they are costing Canadian taxpayers (though others have some pretty good numbers, like the International Monetary Fund). But in a refreshing bit of transparency, the government does note it has not yet actually phased out a single incentive to the fossil fuel industry which was in place in 2015 when they took office. I mention this only because I'm sure the industry-funded astro-turfers will soon be whinging about these electric and hydrogen vehicle focused taxpayer-funded measures (capped at $128 million total per year, if fully spent - less than 3% of the Kinder Morgan payment last year) as some horrid affront to the 'free-market economy' while completely ignoring the annual $46 billion a year in subsidies to the oil and gas industry in Canada (2016 estimate). But as there is no government budget this year (as our democracy requires in terms of accountable government), another piece of disinformation is bothering me: the federal government and mainstream media's fixation on consumer debt in this country. Short response - learn some basic economics and get over yourselves. Stop blaming consumers for acting rationally, and try some rationality yourselves. Today, Equifax announced that non-mortgage consumer debt averaged about $21,000 per Canadian. Oh, the horror! The sky is falling! The end is nigh! Let's look at some reality on this subject, and add some perspective. $21,000 is a good size car loan. What's up in the Equifax report? Car loans. Good news for automakers (yes, we still make cars and trucks in Canada, not just feed stock for their fuel). After getting bludgeoned by the 2008-9 recession (and continuing 'fragile' recovery - as if that were true for most Canadians) which our economist PM SAID COULD NOT HAPPEN HERE, a few of us have put off buying a new vehicle for about 5-7 years, and now really can't put it off any longer. Apparently some people are also borrowing to invest, which while it is debt, likely enhances someone's net worth. If you are really concerned about debt per Canadian, consider that PM Harper has subscribed about $55,000 of non-mortgage debt for every Canadian in the federal debt as of 2013 - so, more than that now - or about 2.5 times as much as we have taken on as individuals. Then there was much theatrical wailing and gnashing of teeth about how Canadians are now using debt as part of their regular consumption patterns, instead of saving, like we used to do in the 'good old days'. Well, if I save and pay cash up front for my purchases, I don't get 1% or 2% or 4% back in credits like I do with my credit cards. Why should I pay a 4% penalty for using savings and cash? In the 'good old days', when the Canadian banks were competent investment managers, my savings account would pay a real return - marginally higher than the rate of inflation. If I put money in my savings account at a bank today, I lose at least 2% a year on the value just to inflation, and likely much more once service charges are added in. Why would I save my money, only to watch it shrink in my savings accounts like CSBs, GICs or other 'safe' savings vehicles? That's not rational. Dear PM Harper, BoC Governor Poloz and Canadian financial institutions: if you want Canadians to start saving, provide an incentive to make it a good financial strategy for consumers, instead of a path to losing money. If you really want to kick-start the economy, increase real wages for the bottom 50% of wage earners. They'll spend that money, creating business and jobs. The OPEC countries know the oil age is coming to an end. That's why they're not curbing production to keep the price of oil high so other countries have a profitable oil sector. Time for the Canadian government and major Canadian oil companies to read the memo. There's a good reason the rest of world is pulling back on their previously planned investments in the bitumen patch. If you think really hard about it, you can figure it out, too. Plenty of other misdirection in play just now, too. More 'tough on crime' pandering legislation which will actually affect about a dozen (or fewer) actual convicted criminals. Suppressing religious freedom - well at least for Muslims. Raising the spectre of 'terrorism' (yet to be defined for Bill C-51), as a justification for the police surveillance state, when they couldn't push those measures through on the shameful and cynical abuse of the memory of Rehteah Parsons. Our elected officals would do well to remember their job is to represent Canadians, not blame us, suppress us and impoverish us. As they said into the lead-up to the the first Clinton election: "It's the economy, stupid." Now, federal MPs, get back to work, the work you are supposed to be doing - for us, not against us. Oh, and Canadian voters, when you get to the ballot box, remember we need a government which is interested in creating a diversified economy and real, full-time jobs, not just fantasize about them all being in Alberta. There's a week left until Ontario's provincial election day. In general, what has struck me is the almost complete lack of content in the platforms other than the ground the Liberals staked out in their budget. Apparently the PCs can't do math, and the NDP can't figure out a budget. As for the gas plant 'scandal', well, looks to me like lots of mistakes were made - including by private sector contractors - and the real damage done is more in the order of $253,000,000 than a billion dollars. It took some digging to find that number. Frankly, in this campaign, be afraid of big round numbers (like 1,000,000 jobs to be created or 100,000 jobs to be eliminated - they look like made-up-for-PR-impact numbers). However, other than the general noise level that seems to come with elections, one thing has struck me in this campaign - the apparent inability of any of the parties, or many citizens, to understand the reality around electricity prices. Hit-and-run sound-bytes abound, and when I try to find the substance behind them, all I can grab onto is smoke. A few examples. PC Leader Hudak claimed that high electricity rates in Ontario are driving jobs to Michigan. So, I looked up retail electricity prices in Michigan - they are around US$0.18 per kWh (before taxes, connection fees, delivery fees, etc.) Allowing for the wounded Canadian dollar exchange rate, that's Cdn$0.20 per kWh. Well, the most expensive retail kWh in Ontario today is Cdn$0.135 - about 35% less than the price in Michigan. Of course, Michigan might be subsidizing corporate pricing to entice business, but apparently the PC platform is against such corporate welfare as well. Time of use pricing in Ontario does not reflect demand periods. Year-round, 7 p.m. daily is the start of the lowest price period. However, most weekdays, 7 p.m. is in the band of the highest use. If we want to help lower electricity prices, let's get the pricing signal right. Start off-peak pricing when the demand is lower. While we're at it, let's create a new 'super-off-peak' rate from 1 to 5 a.m. daily, which is when, on some days, Ontario has to pay other jurisdictions to take electricity off our grid because we already have too much nuclear generating capacity for baseload demand. If we can get some Ontarians to move their electricity demand to this daily trough, we can save money for all Ontario taxpayers. I'd set my dishwasher to start at 2 a.m. instead of 7 p.m. to save a buck or so every day. The delay timer is built right into the machine, and I can figure out how to push it to save money. How about you? The NDP want to take the HST off our electricity bills. Wow! How much will it cost Ontarians to renegotiate the federal/provincial HST deal (remember, we sacked all the old provincial sales tax folks to reduce public service headcount, and get a simpler no-exceptions system, which is why we now pay HST on books and services, where we did not pay PST before). Then, each electrical utility will have to change their billing system to not charge the HST, hire temporary staff to deal with all the issues that will arise during the phase-in period, and presumably Ontario taxpayers will have to absorb the lost provincial tax revenue and cough up money to the feds for the GST (5%) portion they will feel they are still entitled to receive. Beyond all that nonsense, this sends the wrong signal to ratepayers. If we want people to use less electricity, don't reduce the price because that reduces the incentive to make a change. If you are one of those people who are paying over $15,000 a year for electricity for a regular house in Ontario, please get in touch with me. For my regular consulting rate plus expenses, I will figure out how to save you a lot of money. Stephen Harper's party (the nominal Conservative Party) has won a majority of the seats in the House of Commons. Before his supporters take comfort in this, they need to consider that the real winner of the popular vote on Monday was 'Did Not Vote', which comprised 38.6% of eligible voters. By comparison, the Conservative Party of Canada obtained just 24.3% of the votes available in the country (39.6% of the 61.4% of eligible voters that actually voted) - less than 1/4 of voters. So, when Harper talks about his mandate to start implementing omnibus legislative packages with a steam roller, remember that his real mandate came from less than 25% of Canada's eligible voters. When Harper talks about implementing the platform he was elected on, remember what it really was. Eliminate the federal deficit by 2014-15, that is, before the next election. Create more and better jobs, and "complete our recovery from the global recession". Lower taxes. 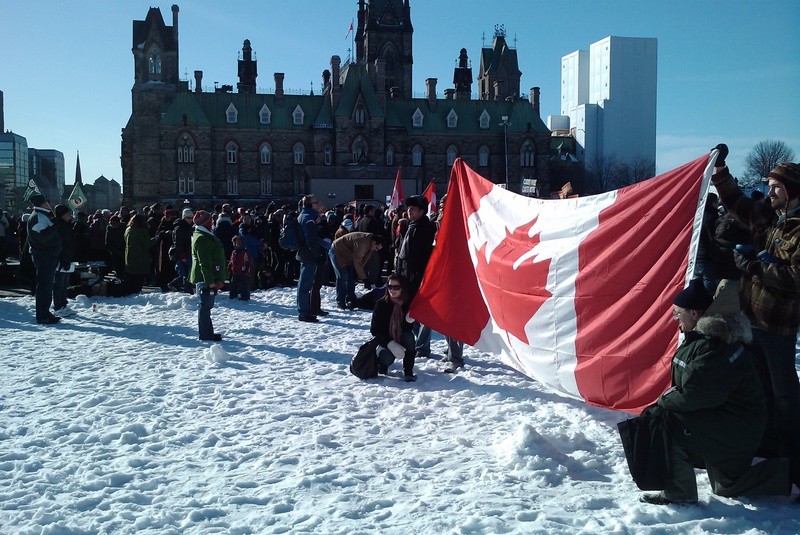 Make Canada safe, support families, and stand on guard for Canada. Even their bit on accountability is short and weak, in keeping with their record where party apparatchiks interfered with access to information responses for political purposes. I expect the NDP Official Opposition is going to take some months to become functional in the Commons, let alone effective. They have a lot of babysitting to do, and I think some of their new Quebec caucus members are going to look a bit weak when they face some real scrutiny about their qualifications for office. Internal matters will keep the NDP from focusing on the national agenda or effectively holding the Conservatives to account for some months. I don't generally comment publicly about U.S. government matters. This is an exception, as I am tired of the contrived media circus that is being thrown up around this issue. I don't want to see them. Nobody else needs to see them. The real proof is that Ossama Bin Laden is not going to appear live and in person in any future videos. For those that argue they need additional proof (videos, photos) that Bin Laden is really gone, we know that if that material is produced, they'll simply say the material was altered or manufactured. Donald Trump and 'the birthers' have proven there is no level of evidence that can be produced that will shake them from their belief. The same will apply here. The media doesn't need this sensational material, except to fatten their bottom line. We don't release post-execution photos of those put to death in U.S. prisons as a matter of course. The same should apply here. Terrorists, on all sides, don't need any more martyrs. So far, President Obama appears to be taking the high road on this matter. It's a nice change from the behaviour of many U.S. federal officials, elected and appointed. The U.S. has some other issues to address. Bin Laden's death was about closure for those affected by the deaths in which he had a hand. Let's accept that closure, with reflection for all those that have suffered losses, and resolve to move forward making a better world for all. As for the results of the recent Canadian federal election, it's going to take me a few days to sort out my reaction to this mess. Or is that low-lights? The Harper campaign has been stressing several points this campaign - just about anything to avoid talking about their actual record in office. Let's look at those points. "The reckless Coalition". Possibly the most meaningless non-issue in Canadian electoral history. There is nothing illegal, or unconstitutional about a coalition government. It worked in Canada during World War 1 - under a CONSERVATIVE Prime Minister - Sir Robert Borden. His coalition with a large number of Liberal MPs was called the Union government. Wouldn't it be nice if the current Prime Minister knew this much Canadian Parliamentary history? Strong Economic Management. These guys are contenders for the worst government for economic management in Canadian history. They inherited a $13 billion dollar annual surplus from the Liberals, and in 4 years managed to turn it into a $50 billion dollar deficit! The largest single-year deficit in Canadian history! And that just a year after Harper boldly proclaimed in the 2008 election that Canada would not have a recession in 2009, nor would his government ever run a deficit. Incompetence or lies? Either way, do you want these guys running your economy in the future? Law and order. Well, they've had five years, and don't seem to have made much ground on this front. They sabotaged their own private member's bill to kill the long gun registry in September 2010. They're adamant we need more prisons for 'unreported crimes'. Well, if a crime is unreported, there won't be charges, and there won't be a conviction, so no need for more jail space. Crime rates in Canada are actually falling, so we should not need as much space for offenders - unless the Conservatives know about a lot more cases of fraud by their officials and staff that are still 'unreported crimes'. Let's face it, if you want to be credible on law and order, stop breaking the law yourself (like calling an election in violation of your own law for fixed election dates). Contempt. This is the one the Harper campaign isn't talking about. It appears no one in the CPC actually understands the reason they were defeated in the House of Commons. They withheld information from our elected representatives. They lied to Parliament. And it appears they misappropriated funds from border security to gussy up Tony Clement's riding for the G8 conference, but for things G8 delegates would never see. This party misused RCMP officers, who were supposed to be protecting the Prime Minister as unpaid bouncers at CPC election campaign events. This party carried out surveillance on people that registered to attend rallies, and based on their findings, barred them from attending 'public' events. This is just a tiny part of the on-going practice of this government that demonstrates their complete lack of respect for democracy and the citizens of Canada. This government is full value for being defeated for being found in contempt of Parliament - a historic event in Commonwealth Parliamentary history. We cannot condone a government lying to Parliament and Canadians, let alone reward it for such behaviour. On May 2nd, vote for better. We deserve it. OK, it's a poor take on Jack Layton's torpedo on Michael Ignatieff in the national TV debate. (You remember, the one where "The Consortium" - kind of like a Coalition, but one the Conservative Party likes - would not let Green Party Leader Elizabeth May participate, but did allow a regional party leader - the Bloc - take part.) However, the point is valid. The Conservative government was defeated on a motion of non-confidence - because they were found in contempt of Parliament because they withheld information from Parliament, and because this government lied to Parliament. It is increasingly clear that this government diverted up to $50,000,000 from border defence to building gazebos and other structures in Tony Clement's riding, which would never be seen, let alone used, by G8 conference attendees, let alone on anything related to border security - more than 300 km away. This government has lied to its employer - us, as represented by the people we elected to the House of Commons. This government has withheld information from us, that our representatives were entitled to have. This government has misappropriated tax money for its own political purposes. What frightens me most is that rather than getting ready to run these liars (that have debased the very democratic principles they are sworn to uphold) out of town on a rail, based on recent polls, Canadian voters appear poised to return them to office. If we won't hold them to account now, when? If the Conservatives won't acknowledge through an entire federal election campaign why they were defeated, and made this election necessary, what kind of delusional government can we expect if they are returned with a majority? A thought about polls. Polls are generally conducted by telephone, to listed land-line numbers. That means, people that don't have land-lines, notably young people that use cellular phones and smart phones as their primary telephone lines, typically don't get polled. As a result, it is likely that the current major polling numbers actually overstate the support for the Conservatives and Liberals - parties that typically pull strongly from the older, more established population. Conversely, those polls likely understate the level of support for the parties that typically pull more of their support from the younger end of the age spectrum, namely the NDP and the Greens. That means that the apparent support for the NDP and Greens in the polls actually reflects a greater change coming than the polls are reporting. Perhaps more Canadians than we think agree that the Conservatives should not be rewarded for lying to Parliament, and the Liberals time in the penalty box is not up for the Adscam scandal. Those Canadians are looking for another option - and fortunately, we have them. So, if ever there was an election where your vote might really count to shake things up in the federal Parliament, this is it. If you want change, you really have to make the effort to vote in this election. This time, it's really your call. Vote for better. I came across this card for the first time today. I thought it was great. If you are a student, and want government to support your studies, then vote. If you are a woman, and want government to treat you equally, then vote for that. If you believe that breathable air, drinkable water and non-toxic food are important, vote for them. If you believe that the best use of billions of your tax dollars is bailing out foreign corporations so they can move jobs out of Canada, then don't vote - that agenda is already well in hand. A is for Attack Ads, a Harper campaign staple because it’s easier than discussing the issues. B is for “Bickering”, the Harper view of democratic process when it is not going his way. D is for Detainees, and the information the Harper government refused to provide to Parliament, in violation of Parliament’s rights. E is for Ethnic, the target voter population, along with “Very Ethnic”. F is for Fraud, as in the convictions for Bruce Carson, and how government funds were spent related to G-8 preparations in Tony Clement’s riding. G is for Guergis, the Cabinet Minister dumped for reasons still unknown (unless it was because she was married to Rahim Jaffer, who committed the unpardonable sin of losing an Alberta seat to the NDP), and after RCMP investigation was exonerated, but never received so much as an apology from Harper. H is for Hidden Agenda, or Harper Agenda. I is for “integrity”, a word that Harper has campaigned on in 3 consecutive elections, but when it comes to delivering on it, he gave us Christiane Ouimet, the Integrity Commissioner that never pursued any of hundreds of complaints lodged with her office, and was given over $500,000 by the Harper government to leave. J is for Joint Strike Fighter, a $30 billion boondoggle, untendered contract (when the Super Hornet is likely a better multi-function aircraft for the Canadian military, at less than half the price). K is for Kehoe (Susan), Gerstein (Irving), Finley (Doug) and Donnison (Michael), four Conservative Party officials charged by Elections Canada with election fraud for the 2006 election – you know, the election that actually brought them to power. Finley and Gerstein continue to collect Senator’s salaries. L is for Lie, because if Harper and his lackeys say them often enough, and loud enough, some people will believe them (e.g., coalitions are unconstitutional – they’re not, or the election is because Harper was defeated on the budget – they were defeated on a finding of the government being in contempt of Parliament – a historic event of international scope, or the economic recovery is due to their management – it’s primarily due to rising commodity prices and Canada being resource-rich, and so on). M is for Majority, the only way Harper can implement his real agenda. N is for Nuking Linda Keen (former head of the Canadian Nuclear Safety Commission) for doing her job, when it ran counter to Harper’s desired view of the situation regarding operation of problematic reactors at Chalk River. Subsequent events proved Keen right. Keen is not alone in losing a job as a result of putting duty ahead of Harper desires. O is for Oda (Bev), who lied to Parliament, but was not removed from Cabinet. P is for Prorogue, Harper’s preferred way to handle Parliament when it is inconvenient. Q is for Quiet, or you’re fired (see http://citizenactionmonitor.wordpress.com/2011/04/10/harpers-record-of-gutting-dissent-gives-whole-new-meaning-to-bully-pulpit/ for a representative listing of Harper’s record for silencing dissent). R is for Running on Your Record, as in the one the Harper government has created over 5 years in power and are afraid to run on, such as creating the largest deficit in Canadian history, while pretending to be competent economic managers. S is for Surveillance on citizens, such as creeping personal Facebook pages for supporters of the enemy, such as Her Majesty’s Loyal Opposition. T is for Tax cuts for big, multi-national businesses, so they can pay less than half the rate in Canada they do at home in the U.S. (16.5% this year and 15% next year vs. 35% in the U.S.), that Harper won’t admit are happening now. U is for “Unnecessary Election”, because Harper doesn’t actually understand the Parliamentary process. V is for Vision, the one Harper has for the future of the country, but is afraid to share with voters vs. that of other parties or Canadians in general. W is for Water filtration systems for aboriginal communities, at least if fraudster and top Harper aide Bruce Carson is lobbying for them – otherwise, the track record is not so good, and more than 110 aboriginal communities have active boil water advisories in effect in April 2011. X is for the mark on your ballot in the 2008 election, called by Harper in violation of his own law setting fixed election dates. Y is for Youth, the demographic that Harper thinks he can safely ignore, and ejected by RCMP bouncers from “public” Conservative party rallies, and almost lost their votes in Guelph due to CPC operative interference with Elections Canada special balloting process. Z is for Zip It, the policy that applies to Conservative MPs that might think of voicing their own views or opinions, even if they are Cabinet Ministers regarding their portfolio. 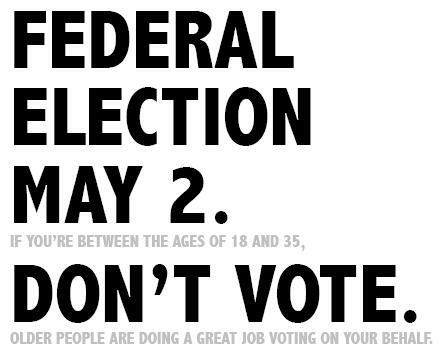 On May 2nd, you can vote for Harper, or you can vote for better. Five years is enough. This election, please vote for better. Mr. Harper, Where is My Apology? I was not barred from attending a Harper rally - I have no interest in attending one based on what I have seen of him over the past 5 years in power. So, why do I want an apology? Because the Harper handlers saw no issue in using the RCMP as free enforcers at their campaign rallies. Sorry, folks, but the RCMP I pay for through my taxes have a specific mandate when they are providing security for the main federal party leaders, and it is not to be bouncers for Harper event organizers. Eventually, the RCMP figured it out, and made an announcement that they actually did understand their job, and acting as free security guards at the direction of Harper lackeys wasn't actually it. What truly concerns me is that anyone, RCMP officers or Harper operatives ever considered crossing this line, let alone actually let it happen. So, let's see the Harper party hire their own security guards, and publicly state they understand they abused their authority in using RCMP in this way, and apologize to the taxpayers of Canada for this abuse of tax-funded resources. Warning: I am in a dark mood as I write this. I have had an unblindered view of reality the past few days, and it leaves me in despair for our ability to think. Today is the first day of the second decade of the third millennium (AD or CE). If you are hung up about the semantics of "Common Era", or the use of a dead language (Anno Domini is Latin) for setting dates, you would be well served to surf elsewhere. If you can't do the math to figure out 2010 was the last year of a decade, rather than the first, or agree that January 1, 2001 (not 2000) was the first day of the 3rd millennium, either figure it out or move to another Website. It's not going to get easier as you proceed through this blog this year. In honour of this 1-2-3 date coincidence, I will be providing 3 pieces of priceless advice. Before that, a little reality as background. We have entered the era of the oil apocalypse. From here on in, we will watch our infrastructure begin to fail and rot. Instead of switching to a sustainable paradigm, we will try to prop up the unsustainable until it collapses, taking us with it. It is not too late to chart a different course, but we don't have the foresight or courage to do so. The price we will pay for this is beyond comprehension, but completely predictable. Oil is now public enemy number 1. Our collective, insatiable addiction to oil is the fundamental cause of many of the world's evils. The 'resource curse' has led to the overthrow of democratic governments, massive loss of life, despoiling of our environment, and climate change. It is the primary cause of resource wars, past, present and future. It is the cause of most government corruption in North America today. Oil is also the underlying cause of our on-going recession / stunted recovery since 2008 in the industrialized world. Our global economy is predicated on cheap oil. That era is over. China is virtually the planet's manufacturing centre now. However, that only makes sense if it is cheaper to ship cheap goods halfway around the world than to produce them locally. Even if shipping were to remain cheap, China will implode as an economic power before 2020. It will likely take the U.S. with it, assuming the U.S. economy lasts that long. Each time our governments use more of our money to fund 'stimulus' projects that are based on burning more oil, the deeper we are digging ourselves into the tar pit. If our government's are truly committed to our interests (as opposed to gorging themselves on oil lobby money), then they have to put all future tax-funded stimulus funds toward localized initiatives that reduce the demand for oil. Period. During the course of this decade, you will switch your energy usage away from oil. It won't be a matter of choice, or doing something good for the environment, or a legacy for your kids, or keeping your kids out of middle-east resource wars, or making a political statement or any other do-gooder motivation. It will be the result of simple financial or physical necessity. In other words, you won't be able to afford it, or potentially able to get it at any price. By 2020, Canada will no longer be a democracy - it will be a petrocacy. Despite the wealth generated from the tar sands, selling oil to those that can afford it, most Canadians will be living in poverty, as they were not prepared to stand up for their rights when they were being steadily removed in the previous two decades. I promised to offer you 3 pieces of priceless advice. Here they are. 1) If you heat your home or other structure you value with oil, switch to something else. Investigate the concepts of passive houses and zero energy houses. Upgrade your insulation and weather-sealing. Seriously look into active solar heating - the fuel is free. Beyond that, look into geothermal (ground-source heat pump) systems, or automated wood-fuelled (e.g., pellet stoves) systems. (Natural gas may be a bargain for a few more years, but it won't last forever.) If you can't make these work with your current abode, move somewhere else where you can. 2) If you use petro-based (gasoline, oil, propane, natural gas) transportation today, find an alternative. Walk, bicycle, public transit, homebrew biodiesel, electric car or whatever else you can think of and will meet most of your needs. If you think your job will survive the oil collapse, perhaps you should move to within walking distance of it, or find work you can do primarily via telecommuting. 3) Learn how to fix things, and otherwise generally be frugal. The end of cheap oil means the end of cheap, disposable, plastic goods. If you can fix things, you will be valued in your community for that ability. "that the Government of Canada is taking action to reduce greenhouse gas emissions in the electricity sector by moving forward with regulations on coal-fired electricity generation." "Phasing out the coal plants, however, won't start until they reach the end of their lifespan. For more than half of the units in Canada's 19 plants, that isn't until 2025." And new ones can be built, presumably either according to the current regime, say if construction starts before mid-2015, or according to new regulations thereafter (which are likely to embrace a decades old combined cycle technology). After all, the new rules will likely be decided upon by the vested interests in the coal industry and electricity generators - not environmentalists and asthmatics. And the new stricter regulations? Not drafted yet. Maybe by 2011. You know, if they don't get killed by the December 2010 prorogation. They won't come into effect until at least 2015. A lot can happen in five years, like regulations getting revised, watered down, or simply revoked or lost in the shuffle. Early in February 2010, the Ontario Ministry of Transportation stopped accepting registrations for electric vehicles in the province. There was no announcement, and no consultation with EV advocates or owners. The first few EV owners turned away at licence bureaus did not even get a reason for the refusal. When pressed for information, MTO officials offered up some weak reasons. First, apparently large numbers of Ontarians were fraudulently claiming their vehicles were powered by electricity, so as to avoid Drive Clean tests. However, MTO's own data show less than 100 cars and light trucks are registered as electric in Ontario. (I can personally identify about 40 of those that are legitmately electric powered.) MTO has the authority to inspect anything they deem suspicious, and there are stiff penalties for false statements on registration forms, including fines and jail time. Prior to the secret licensing ban, electric vehicles in Ontario were subject to exactly the same safety inspection, licensing and insurance rules as any other vehicle on the road. The question MTO still has not adequately answered is why this small population of clean-air, environmentally-friendly vehicles has been singled out for this degree of persecution, when street-racers actually have to commit an offence to suffer any penalty, and gross polluters can continue to operate on 'conditional' passes. For a government that claims to support green vehicles, this government has a very strange way of showing it. Reasoned discussions with MTO officials since the secret ban was discovered have dragged out over many weeks, with little sign of progress toward getting the vehicles re-legalized in Ontario. The only incentive the Ontario government offers for buying or making an electric vehicle, small as it is, ends on June 30, 2010 with the introduction of the HST. For more information on the Ontario electric vehicle licensing ban, visit the 10n10.ca Web site. Well, if we were hoping the Tories would come back from their ill-advised prorogation and extended vacation in a better mood than they exhibited at the end of 2009, we've certainly been given notice that's not going to be the case. First, we have seen 2 Cabinet ministers go postal on airport security staff. Not good form for a government that rides on the law and order agenda, especially after gutting their own legislation with the prorogation in 2009. But it's worse given the growing perception that this government has lost touch with voters, is chafing under the constraint of a minority government that won't let it ride roughshod over Canadians with a right-wing agenda they have to keep under wraps lest Canadians figure it out and toss them unceremoniously from office. Making matters worse, the slap on the wrist meted out to Rahim Jaffer smacks of two-tier justice. The Throne speech and budget documents presented don't indicate any change of direction or "re-calibration" that could possibly warrant the prorogation. That just makes it that much more evident the prorogation was a stall tactic, likely trying to defuse the Afghan detainees committee hearings. That history taints the idea of having a judge vet materials to which the House of Commons has full rights to see uncensored. Our MPs are our final line of defense in trying to get to the truth in government matters in our system of democracy. Putting them off puts the definitive lie to this government's hollow claim to being open, accountable and transparent. However, the crowning touch in this 2 weeks of hypocrisy has to be that a government MP had to filibuster a House of Commons committee in order to prevent the appearance of witnesses that could shed light on how the government has been dealing with an agency where it names the directors. This is not the behaviour of a government with nothing to hide. Bring on the contempt of Parliament motion! If this government really wants to make Parliamentary history, let's get to it! As a Canadian, and solely a mainstream observer of the events of the past two weeks of the Vancouver Olympics, I admit to a degree of second-hand pride in what I have seen. I'm sure there were issues I missed, and a couple of blemishes we all saw, but all in all it appeared a colossal success! Yesterday provided the crowning touches: 14 gold medal performances - the most by any country ever in a Winter Olympics; the men's hockey final with a script that could have been written for film; and, a closing ceremony that poked a bit of fun at the glitch in the opening ceremonies and allowed Catriona LeMay Doan a do-over on her opportunity to light the flame. However, this builds upon years of work by many people with inspiration, dedication, and perseverance. It was truly a showcase for this country, to the world, and more importantly, to ourselves. From using the event as an opportunity to teach people work skills, to the design and construction of the torches for the cross-country torch run, to battling the climate itself at Cypress Mountain, to the inclusion of the First Nations, to the design of the beautiful and unique medals, to showcasing an electric snowmobile at Whistler. We should also take a moment to think of all of those that were successful because we did not notice their efforts: facilities construction and maintenance, logistics required to house the athletes, spectators, media and others; the security staff who maintained order and ensured this event did not become a spectacle of the unwelcome sort; the games organizers and volunteers that kept things running in spite of the challenges seen and unseen by outsiders. Of course, this generation of Canadians will never forget the performance of the Canadian athletes, who clearly were the focus of the event, which is as it should be. Let us all look back on these games as symbolic of what we can accomplish, on the podium, building the podium and behind it. Let us move forward with this flush of success on so many fronts, and with quiet pride build on it to create an even greater legacy that celebrates co-operation, inspiration, and perseverance - truly Canadian qualities. Perhaps it's the discontent of watching the Canadian men's Olympic hockey team beaten by the U.S. on home ice that has put an edge on general angst caused by a recession that won't relent, but it seemed oddly appropriate that this item should surface today: Rogue Stimulus: The Stephen Harper Holiday Anthology for a Prorogued Parliament . Undoubtedly hoping to bask in the glow of the Vancouver Olympics, Prime Minister Harper is the first PM to address the British Columbia Legislature. However, this venue offered other advantages. First, Harper's home turf is closed for the season due to his decision to prorogue in late December, scuttling his own law and order agenda that was on the order paper. Second, as he is not a BC MLA, he couldn't be questioned in that House. Third, no opportunity for the media to ask questions, something of a hazard associated with press conferences. Fourth, he could rely on BC security services (beefed up for the Olympics) in the event that the rabble, er, citizens decided to voice their opinion. Today, the Ottawa municipal government announced its intention to increase residential water rates by 10% in 2010. This follows three previous annual increases of 9% a year - about 40% in 4 years! This time its supposed to pay for rainwater storage to prevent overflows into the Ottawa River during rain storms. A mere $140,000,000.00 is the initial estimate, to store 12,500 cubic metres of storm water. Given it's an Ottawa project (where 0 means 4%), we can be sure the final tab will be considerably higher. Hmmm, I figure 12,500 cubic metres would fill about 62,500 rain barrels. Figuring the city could get those for $40 a piece or less in that kind of bulk buy, that would cost about $2,500,000, and would result in a lot of rainwater never seeing the municipal wastewater treatment system. That's probably about one rain barrel per four homes in the Ottawa area. $2.5 million or $140 million? As an Ottawa taxpayer, there was never any doubt in my mind which way our municipal government would choose to go on this one. Want to protect your household budget against this tax grab? Unfortunately, buying a rainbarrel won't necessarily do it unless you use it to replace a lot of municipal water for your lawn or garden. However, an inexpensive device that saves you water when your toilet fills just might, as toilets typically consume a third or more of our total residential water use. Save water and your money, or keep feeding the Ottawa tax monster - your call. If the too little, too much deal Canada struck with the U.S. this past week is what we get as a result of the government not being distracted by Parliament due to the prorogation, let's get them back in the House of Commons ASAP. As we're getting a look at the fine print, it's not looking pretty. The Council of Canadians comments on Ottawa Citizen article "Don't celebrate this deal", which was the original topic of this item. What are Canadian Investors Smoking? Here are a few interesting little factoids. In October 2008, the TSX composite was trading between 9,000 and 10,000 points. In January 2010, when we have 280,000 fewer Canadians employed, and even more less-employed (now working part time as opposed to full time previously), the TSX composite is trading above 11,000 points. Note that this drop in employment is in spite of billions of dollars of government stimulus over the past year in Canada and the U.S., intended specifically to create jobs! (e.g., HRTC) This means that our government debt is growing, and we're going to have to make it up in the future via increased taxes. (First instalment coming in July for residents of Ontario and British Columbia as they fall subject to the HST.) Maybe it won't ding you much, but paying an extra 8% on all services and many of the products we buy is going to make a decided dent in our disposable income. If we're likely to reduce our real consumption by 5 to 10% annually starting in the third quarter, what's that going to do to Canadian retailers and providers of services if most other Canadians do the same, because they're still waiting for the alleged economic recovery? Credible commodities analysts are forecasting reduced demand later this year as major consumers built up inventory during 2009 when things looked relatively cheap. If commodities (oil, coal, base metals, etc) take another price hit or reduced demand or both, and we have fewer Canadians employed now than 15 months ago, where's the cause for optimism in the investment arena? Jobs Report - Not Happy Days Yet! The key words in the reports today were not 43,000 new jobs. The key words were "surprising", and "15,000 expected". I'm out here on main street, and I got one of those 43,000 jobs (at least as Stats Can would report it). And it's one of those part-time jobs, which made up 97% of the reported increase. Yup, just 3% of the net new jobs in January were full-time. This is in the wake of our federal government's full-court press on the stimulus side committing billions of dollars into job creation, and it managed to create just 1,400 new full-time jobs in January. Remember, we're still down almost 300,000 jobs from where we were in October 2008. And this presumably doesn't include the damage done by Toyota shutting down multiple assembly lines last week, and what that's doing to their local suppliers. CBC.ca article "Jobless rate edges down to 8.3%"
Then there's the hyping of the non-news on the Buy America front. In spite of the headlines, this "victory" is really just window dressing. Essentially, Canadian companies now get access to the American stimulus program, but only after the money under that initiative has already been spent (only 12 days remain under that initiative), and only in 37 of the 50 states. And only after many Canadian companies shifted operations and jobs to the U.S. in order to be able to participate, and there is no sense of whether any of those jobs are ever coming back to Canada. Further, the deal does not apply to any future U.S. government spending, so this "win" has a two-week shelf-life. No jobs are moving back north of the border for a two-week window of opportunity, especially given the flip-side of this deal. You see, U.S. companies now get unfettered access to Canadian provincial and municipal spending which is still in the works, and there are no apparent exclusions (like being limited to stimulus fund spending), or a sunset clause on this access. It appears Canada has been panicked into giving up more of its economic sovereignty while accommodating a change the U.S. needed to make anyway to deal with the reality that our two corporate sectors are inextricably intertwined already. Coincidentally, U.S. officials announced that they expect to double U.S. exports by 2015, which will be difficult if other countries elect to match the Buy America restrictions going forward. Globe and Mail article "Ottawa hails Buy American deal"
CTV.ca article "Obama dilutes 'Buy American' rules for Canada"
"The two break weeks need to be cancelled so we can work hard. We want to sit as much as possible in order to get the measures passed that we think Canadians want to see passed." This from the brain-trust that felt there was so little of value for Parliament to do in mid-December that the only reasonable course of action was to declare a two-and-a-half-month vacation and kill all the Bills on the order paper. Bzzzzt. Wrong. Thank's for playing. The national issues of December have not magically disappeared just because you chose to run away from them for a few weeks. There's no reason to believe they could not be dealt with at least as effectively now as a month or more in the future. The longer this takes, the more it looks like the CPC ran for cover before New Year's, and it is proving more and more to be an irresponsible course of action. Time to head back to the bunker and "re-calibrate" this message. [*Sorry, CTV.ca has lost this article in their own recalibration exercise.] http://www.ctv.ca/servlet/ArticleNews/story/CTVNews/20100204/Tories_Hit_100104/20100204?hub=QPeriod"> CTV.ca article "Tories scramble to recover from prorogation hit"
Yesterday, Justice Minister Rob Nicholson indicated that the government needed to pack the Senate with 5 more appointments to force through the CPCs crime agenda. This is ironic on at least a couple of levels. First, the reason the CPC crime agenda isn't becoming law is because the Prime Minister keeps proroguing Parliament before any of this legislation can become law. Second, because this Prime Minister said he would reform the Senate, and not keep using it for patronage appointments like his predecessors. Seems to me, if the other parties in Parliament want to make Parliament work, this is their golden opportunity - assuming the House ever sits again. The 3 other parties could build a package of bills they want to see passed and propose them as Private Members Bills. Then, they can filibuster whatever government legislation they don't want, and push through the Members' bills they do want. Of course, this would require that the MPs and Senators of not of CPC colours would have to act like adults and put the interests of their constituents ahead of personal and party agendas. Oh right, that's what they're supposed to be doing in the first place. Is the prorogation creating a groundswell to counter the PR value of the government's efforts on the Haiti earthquake file? Perhaps so, according to this Globe and Mail article about recent EKOS polling. No question the feds have been quick off the mark with the response, including using our tax money to match all private contributions by Canadians. However, the prorogation is forcing many Canadians to question if our democratic rights are actually safe with a government that seems to treat them in a cavalier manner. The poll suggests that Canadians do want the Prime Minister to bring the House back before March. Given the Prime Minister's usual response to the desires of Canadians, I think we can be quite sure this means he will not. So the question becomes, what will those that value democracy, accountability, open and honest government do with the interregnum? "During a period of prorogation, all committee activity ceases and, as such, all orders of reference and committee studies lapse. No committee can sit during a prorogation. The only aspect of a committee's work which survives prorogation is a request for a government response to a committee report." House of Commons Web site. One of the reasons that this prorogation may have appeared attractive to the government is that a Parliamentary committee examining the question of the treatment of detainees in Afghanistan was getting uncomfortably close to proving that the government has either lied to the House, or shown a remarkable lack of interest in unearthing the truth as revealed by Colvin. Apparently some Canadians are being hoodwinked by the government spin specialists into believing that the prorogation is just a normal Parliamentary procedure, and its repeated use in 2008 and 2009 has no implications for the practice of democracy in our country. That's not the case. Prorogation doesn't stall legislation in the House of Commons and the Senate; it kills all the Bills in progress. Some may be resurrected in the next session, but there is no guarantee of that. Have a look at the legislation that was killed by this prorogation. In reality, that's most of the work that Parliament had actually done anything on in this session, including multiple Bills related to the CPC "Law and Order" agenda, which apparently isn't so important anymore. Prorogation is a time-honoured Parliamentary procedure. CPC apologists, please note that we are not arguing that point. Our issue is with the now annual inappropriate use of the procedure by this government. "The most common use of prorogation in current times is to allow the government to re-cast its plans and agenda once it feels it has accomplished enough of its goals from the current session. It will then prorogue Parliament and set a new agenda through a new Speech from the Throne." It is NOT intended as a way for a floundering minority government to avoid a non-confidence vote (CPC December 2008 - ending a session that was just 13 days old), or to shut down the work of Parliamentary committees that are proving the government has ignored its legal and moral commitments as the legal representative of our country regarding international law and negotiations (CPC December 2009). It's pretty clear that this government had not accomplished the bulk of its goals after 13 days of business in 2008, nor has it accomplished the bulk of the work it set out in its last Throne speech given the number of Bills that died on the order paper this time around. My MP is not serving my interests by going to the Olympics or sitting in his riding. Government serves my interests by addressing the issues of the day in Parliament, by working in committees and passing legislation. If there is one benefit to be had from the current prorogation fiasco, I hope it is that Canadians will understand that the current government is putting its own interests ahead of the citizens it is sworn to serve, and perhaps our media will understand that Canadians want their fifth estate to provide real coverage of what our government is doing (or not doing). As if it were an omen, today began bright and sunny - the first day of full sun for weeks in Ottawa. 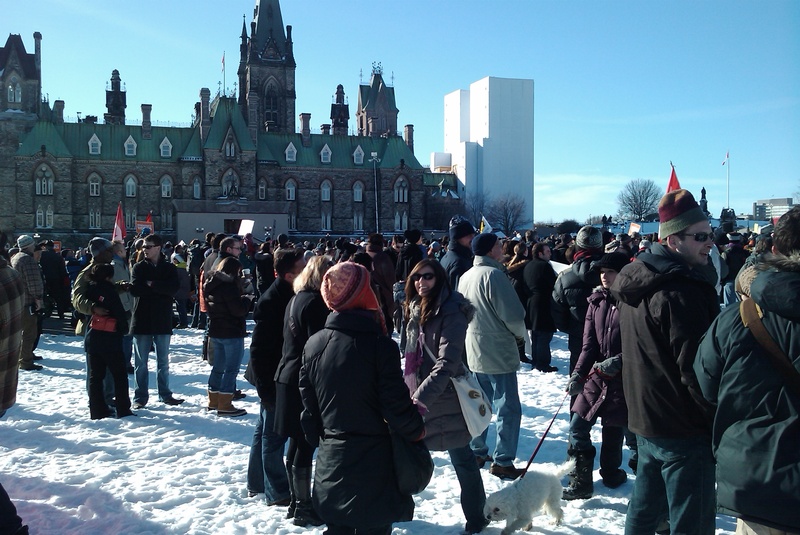 The bright light shining on those braving the chill on Parliament Hill today was in stark contrast to the opacity of the current government and what they hope to hide behind the cloak of prorogation. It was an honour to share the front lawn of Canada's house with so many others that truly believe in democracy for our country. We couldn't stay for the whole time of the protest due to other commitments. However, I appreciated the words of Trevor Strong (Arrogant Worms), both in his song The Wild Proroguer and before hand. I won't get this exactly right, but they were to the effect of "When someone like me comes to a protest rally, there’s something seriously wrong." Those words resonated with me. The following presenter also said something that continues to haunt me today: "Who would ever have believed that we needed a pro-democracy movement in Canada?" Sadly, it is clear we do need one now that Prime Minister Harper has chosen to rewrite history as to what is an appropriate use of prorogation. This is not a government that has finished its mandate. It left a lot of unfinished business in terms of Bills before the Houses. Clearly, the economy is not running as well as when the CPC took office. Any Canadian that understands democracy knows that this is not a time to hide from questions and accountability, but to work with all comers to address the issues of the day, and to be seen doing so. Democracy isn't easy, but our forebears understood it was to be cherished, and some gave their lives for that cause. It is truly disturbing to see elected leaders casting it aside. We did not have a great vantage point for viewing the presenters or the crowd. 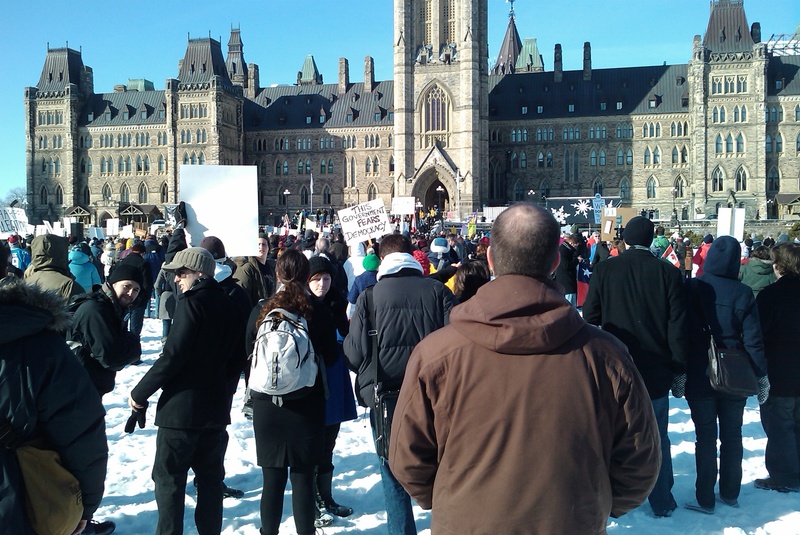 I estimate there were about 3,000 people on the Hill. We were proud to be in their number, and we want our representatives to know we're paying attention, and we are unhappy with their current antics. There is work to be done, and we elected our MPs to do that work because they offered themselves up to do it. It's time for them to get back to it. Our athletes can represent us at the Olympics. The place for MPs is in Parliament! Out of my angst over the botched COP15 conference at Copenhagen, something positive! Faced with a federal government apparently indifferent to the democratic process that put them in power, and opposed to taking action on climate change, at New Year's I decided to do something. 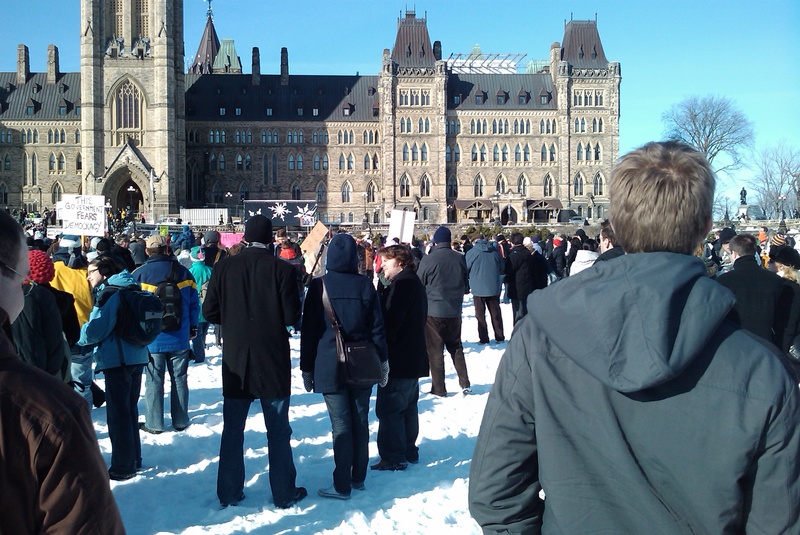 National polls say Canadians want to take action on climate change. I know I do. So, I have made it my New Year's resolution to reduce my personal and household greenhouse gas emissions by 10% in 2010. I have already spent years reducing my use of fossil fuels, so this won't be an easy undertaking for me. Still, I intend to do it. I call it 10 in 10. The site has been up for about 2 days now, and already I'm pleased with the response. Designed for Canadian consumers / citizens, the site will provide tips on a daily basis, and additional information over the course of the year, to help make this reduction, and to do so as painlessly as possible. Feedback and suggestions on topics, or questions you would like answered are welcome. Please drop by the site and let me know what you think. Despite the best efforts of the spinmeisters to paint an 11th-hour pseudo-agreement to try to reach a future agreement for non-binding resolution to reduce our greenhouse gas emissions to a level that isn't low enough as a success, most watchers (who didn't succumb to the inanity of it all) have reached a different conclusion. It was a lost opportunity, which wasted precious time and resources, driven by those who still put their own short term gain ahead of the long term benefit, and potentially even survival, of the human species. Our governments abdicated their responsibilities to their citizens in favour of the fossil fuels industries. It has never been clearer than now that governments are not in tune with the desires of their citizens on the issue of climate change. If they were, we would have hard emissions targets for 2010, not fantasy goals for 2030 to 2050. If we really want to make a difference in the short term on climate change, we need to start turning things around now. Most of us don't have the financial wherewithal to make a dramatic change in our energy production (e.g., putting in a solar power system to reduce coal-fired generation). However, most of us can find ways to reduce our actual energy consumption, especially if it means we can also save money. This is my resolution for 2010: to reduce my fossil fuel consumption by 10% or more in 2010 relative to what it was in 2009. That is a hard target for 2010. I call it 10 in 10. This is not about trying to send a message to our governments. This is about making real progress on climate change in spite of them. I recognize that a 10% cut is not enough to solve the problem. However, it is a start in the right direction, and for many years, our industrialized and industrializing nations have been going in the wrong direction. I have been trying to reduce my greenhouse gas emissions for some years now, so I don't have a lot of easy things left to do. However, I think this is important, and I intend to do it. One person doing this won't have a measurable impact, so I want more people to participate. I also know it's easy to ask, and most of you think this will be hard to do. So, here's my offer. If readers of this blog indicate a reasonable level of interest, I will supply suggestions on how to reduce your fossil fuel use, and likely save money doing so. A New Year's Resolution for 2010 to reduce greenhouse gas emissions and save money doing it! "10 in 10!" If you are with me, please let me know and spread the word. Together, we can make the difference. Reducing our energy costs by 10% should help make for a prosperous New Year! This Canadian Press item echoes my comments over the past several months that the "funding commitments" much ballyhooed by CPC cabinet ministers are not actually flowing in significant measure, or generating the postulated economic benefits. Let's face it, anything requiring three levels of government to agree, let alone act, is not going to happen quickly. Given that the recession is not lifting in response to rhetoric, let's hope that we really do see people getting hired starting next construction season to actually get something done. In the meantime, it's still going to be a hard winter for a lot of Canadians, as EI benefits run out, and the promised reform measures aren't happening. No wonder the government elected to get out of town early for their Christmas break this year. Over the past few months, many of my blog posts have related to electric vehicles. As I have spent time the past few months watching the mainstream media, it has become clear to me that there is a lack of coverage of EV-related news in general, and of knowledgeable discourse in particular. Further, the topic deserves a sense of coherent synthesis that is almost completely lacking. Therefore, as time permits, I hope to fill that void in the new Econogics EV Blog. For those of you that have enjoyed my blogs on other subjects, please rest assured that I intend to continue it as well. However, for those looking for a focused point of information about electric vehicles from a Canadian and entrepreneurial / consumer view, I think the separate EV blog will become a valuable resource. Ontario finally legalized the Low Speed electric Vehicle (LSV) this past summer, just a decade after U.S. states did so. But in an artful display of doublethink, they then added regulations that ensured no production model could qualify. Then, when they announced incentives for electric cars in July to take effect in the second half of 2010, the LSV was specifically excluded from the incentives, although it would have qualified based on the skimpy details provided at the time of the announcement. Stay tuned while they find a reason to exclude conversions and the few EVs already on the road in Ontario from the incentives as well. It's not as though we really want to foster a new, green industry in the province that would create jobs (vehicle manufacturing, sales, batteries, electric motors, other components). Now with confusion as to what incentives will really apply in the U.S., and when, it appears more of the erstwhile EV makers will likely disappear. Last week, Chrysler walked away from its earlier commitment to deliver 3 different models of electric and electric-hybrid cars. Today, there is a rumour that forward-looking EV darling Aptera is in trouble. While GM continues to advertise their Volt plug-in hybrid prototype, the actual delivery date keeps sliding off into the future. Remember, when originally announced in 2006, it was supposed to be in showrooms by now. Most recent guess - late 2010 - in limited numbers. GM will yet find a reason not to deliver. The last time they were forced to deliver (1996), they started a blood war with the State of California that concluded with a concerted search and destroy mission to eradicate the EV-1 from existence. They got that concession in return for a promise to deliver hydrogen fuel cell vehicles to showrooms in quantity in 2008. Per usual with GM and environmental commitments, never happened. GM may have to change its colours due to government and UAW ownership, but green isn't one they will adopt willingly. If you want a sense of how this is going to end, find a copy of The Lost Cord by Barbara Taylor. Enthusiasts and small conversion companies have built literally thousands of on-road electric cars, trucks and motorcycles in North America in recent years. It's a viable option, and more likely to achieve results than continuing to wait automakers that have fought the technology tooth and nail for decades while pretending they'll deliver someday. Air pollution, water pollution, noise pollution, climate change, dependence on foreign oil; you can continue to wait and hope that someone else will solve the problem for you, or you can ACT! Yesterday, I spent five hours at the Green Home and Lifestyle Showcase at Algonquin College. Turnout for this free-admission event was light, so it afforded me time to have longer discussions than is usually the case at tradeshows. Further, it was a no-sales, information-only affair, so I was looking forward to some animated discussions with college students, as the event was situated on their turf and the price was right. In that regard, I was rather disappointed. Before I proceed, let me set the stage for you. I was sitting behind a small table, along with 40 to 50 other exhibitors, most with identical tables. Most of the tables were set up with product or advertising services, and most were on topic, though a couple seemed out of place to me. My table featured literature related to electric vehicles (green transportation lifestyle choice), battery chargers for small electric vehicles, a battery charger for off-season battery maintenance (extends battery life – so less recycling or landfilling), the Water Saver toilet fill diverters (household water conservation), three copies of my book, The Emperor’s New Hydrogen Economy, (which is all about environmental lifestyle choices), and some supporting materials (business cards, copies of GreenLife magazine that have reviewed the book and the Water Saver favourably) and some brochures. Over the course of the evening, it became clear there is a generation gap even in the area of environmentalism, and if the young people that wandered by my table are representative, then our environmental future is in trouble. The evening featured these gems from the mouths of babes. “We can already buy electric cars, so why would anyone bother to make one?” Apparently the automakers are airing so many ads about their electric-assist gasoline cars (alleged hybrids) and the electric and plug-in hybrids they might sell someday, that people believe they’re already here. Nope, we’ve actually lost ground on this front since the 1990s when California actually had the gall to represent the interests of its citizens instead of corporate America. “We have lots of water in Canada, so there’s no reason to buy some gizmo to save it.” This one still leaves me speechless. 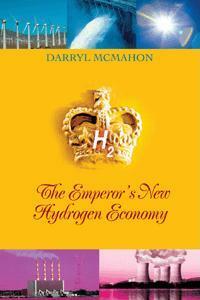 Upon studying the title of my book for several seconds, “So, if hydrogen is so great, when will we really start to use it?” This is the one that convinced me there is a generation gap. Of the folks that stopped by that I judged to be over 30 years old, it was clear from their expressions that they got it, usually almost instantly. However, there was hardly a glimmer of recognition from those I judged to be under 30 years of age. Has Hans Christian Andersen been Disneyed out of the North American childhood lexicon? Are books and independent thought passé? “Why do you think it is important for companies to have green credentials to succeed?” It was clear my answer did not please the person asking. You see, in my experience green credentials are more harm than help in the success of a for-profit company. The average consumer has no interest in green benefits when buying products; the focus is price (not even value) over all else. This is the foundation of Wal-Mart’s success, and their success has bred copy-cats in the rest of the consumer market, which in turn has caused North America’s manufacturing meltdown in favour of the “Made-in-China Syndrome”. If you want your business to become large and financially successful, you need to abandon all sense of social responsibility, including sustainable practices, to get there. Here’s the Fortune 500 list of the largest companies in the world. Let’s have a look at just the top 25 for illustration of my point. Number 1 is Wal-Mart, noted for importing toxic consumer products from China and helping empty out the manufacturing sector in North America (exporting jobs). Number 2 is Exxon-Mobil, the largest of the eight multi-national oil companies in the top 25 (32%), an industry noted for oil spills, land degradation, air and water pollution and questionable human rights practices. Number 5 is Toyota Motor, the largest of the five automakers in the top 25 (20%). Number 7 is ING Group, the largest of the nine financial/insurance companies on the list (36%). This sector is largely credited with triggering the current global recession due to their irresponsible actions over the past decade, and noted for its bottom-line lack of compassion. Rounding out the group are [Link has bit-rotted: http://www.corpwatch.org/section.php?id=16] General Electric (#12, major weapons manufacturer) and State Grid (#24), the Chinese electrical power distributor, likely the largest primary customer for coal-fired electrical generation on the planet. So, I don’t see any significant green credentials anywhere in that lot (and General Electric’s wind turbine division is a trivial part of their overall holdings, which is much more interested in selling nuclear reactors in the electrical generation business). I do know a few companies with green credentials. This typically also burdens them with a social conscience, and that tends to skew their priorities away from growth for the sake of growth and toward things that improve quality of life. It almost goes without saying that this approach makes for small, human-scale operations. Consumers vote with their wallets, and so far, the zombie shoppers have elected Wal-Mart as world dictator for life, and consigned small local businesses to the trash heap. It’s your planet. If you won’t look after it, who will? Sorry young adults, but you are sowing the seeds of the whirlwind you will reap in years to come. The establishment now considers you to be so societally and politically disengaged that you are no longer even worth the effort of targeting or recruiting (because you don’t bother to vote). Ironically, if Canada’s youth coalesced around a political message (say, we want a habitable, non-toxic planet for our future), they would have the weight to really effect change in the current fragmented political landscape federally and in most provinces. Personally, I’m shifting my focus to the old fogies because they actually seem to care. Two things really struck me. The first was how few companies made an appearance here given the apparent level of interest in EVs in the world media and the Obama Administration. Perhaps this is a reflection of the total lack of interest, or even hostility, towards EVs being demonstrated by the Canadian federal government and most provinces, even those starting to talk 'green'. By contrast, the delegates at the conference seemed very upbeat about what they were hearing at the presentations. The second thing that struck me was the David and Goliath image presented by Steve Dallas and his stunning home-built electric car that works today vs. the GM Volt prototype. While Steve invited people to sit in his car, GM reps were on hand to ensure no one took that liberty with their vehicle. Steve is from the Toronto area, in Ontario. The Ontario government recently announced incentives to take effect in 2010 that would substantially subsidize the price of the GM Volt (which will not be built in Ontario, if it should ever become available for sale. Because Steve showed initiative and built his own electric car, it will not qualify for any incentive under the provincial program. With that sort of tilted playing field (announced tax dollars support for an unavailable hybrid to be made outside the province; no support for an electric car built in the province), it should come as small surprise that Steve has no interest in producing more copies of his smart 2-seater electric car. Pity. To understand what's really at play, we need to look at the figures for the labour market unemployment rate and the labour participation rate. Those [link has bitrotted: "http://www40.statcan.gc.ca/l01/cst01/indi02a-eng.htm] figures from Statistics Canada put the lie to the implied good news. In fact, the unemployment rate went UP, not down, by 0.1% from July to August, and up by 2.5% from the previous year. The total number of people employed has fallen by 1.7% from August 2008 to August 2009. The mainstream media completely ignored this story. That's unfortunate, as this could be the moment that changes everything for automobile transportation in the next decade! Renault now has the order they need to start real mass production of an all-electric, battery-only, car. That's the volume that can achieve volumes of scale to make electric cars truly affordable, at least in Europe, in the next few years. Those of us living in North America can rest easy, knowing that our domestic automakers have no intention of providing us with a real electric car any time soon. I would like to thank you for your government's recent apparent reversal regarding support for clean air transportation in Ontario. It's as if someone flipped a switch and your government finally got the message. You know, THE message. As if someone finally put together the devastation of climate change from burning fossil fuels in our vehicles, the burden of health effects caused by automotive emissions, and the need to foster an economic environment that is about sustainability instead of the extinction of the human species, and grasped that there is an answer. It's hard to believe that this came from the same government that had to be badgered into allowing electric-assist bicycles in the province, and only relented in 2006 with a pilot program. Or the same government that only grudgingly permitted Low Speed electric Vehicles (LSVs) on our roads this year, and with such harsh restrictions that no one will build a vehicle to meet the unique and oppressive Ontario regulations; and that a decade after the federal government created the classification. Or the same government that took away preferential license fees for electric cars a few years ago. Or the same government that still prohibits electric motorcycles from using major Ontario highways. However, I am confused by the one-year phase-in period before any of the announced incentives come into effect. Why not let the pioneers that already drive battery electric and plug-in electric hybrid vehicles benefit now? Why not provide a retro-active reward payment to those with licensed vehicles as of the effective date showing a Motive Power of E(lectric)? If the motivation really is putting clean air, electric cars that produce less Greenhouse Gases on Ontario roads, why not reward those innovators that are already doing so? My fear is that this government is not so much interested in cleaner air as they are in providing an additional bail-out to GM and Chrysler, now that you are shareholders. The devil is in the details, and my concern is that your government will restrict the incentives to specific makes and models, as it did with the fuel efficiency incentives of recent years. On reflection, if your government had taken this stance just three years ago instead of putting it off another a year into the future, perhaps we would have a domestic market for the burgeoning surplus of electricity in the province. A surplus that has reached such proportions that we are now shutting down perfectly functional nuclear reactors to reduce the supply. Further, last summer, when gasoline was over $1.40 a litre, Ontarians would have had another option for their transportation needs – electric vehicles. Personally, I look forward to getting my Green Plates for my current, highway-capable, electric car, and I hope this signals a pervasive change in your government's attitude toward electric and plug-in hybrid electric vehicles. Now, if only there were HOV lanes in Ottawa. Last week, North American stock and commodity markets were showing a correction (downward trend) that was comprehensible given underlying economic data. This week, a rally has taken hold that defies understanding. The underlying fundamentals have not improved markedly. Unemployment figures continue to rise. Earnings reports may be 'beating expectations', but in general they are not particularly good. Those companies that are showing increased earnings are doing so by slashing expenses - including ongoing maintenance and normal internal infrastructure investments. While that may improve the bottom line in the short term, the real concern is that the top line is not improving. In the longer term, the current cost slashing is killing the goose that lays the golden eggs. This cost slashing reduces employment and purchases from suppliers. In turn, the suppliers reduce inventories, dropping their purchases and leading them to cut jobs as well. As more people lose jobs, they reduce their expenses, including housing, dining out, consumer products, entertainment and services. All of this feeds the downward spiral. The downward spiral means more businesses will see a continuing decline in their top line. If that continues, eventually they have to close their doors. Until we see some sign of recovery (not just a slowing in the rate the economy is shrinking), there is no fundamental reason why the equity or commodity markets, as a whole, should be rising in value. Companies will not be growing. Consumer discretionary income will not be increasing. If consumers aren't buying, then companies that service them (e.g., automakers, appliance makers, housing, airlines, banks) aren't selling, or making profits. That means no earnings to pay out to shareholders. So, where's the basis for the apparent enthusiasm for equities and commodities the past few days? Ironically, the trigger for the rally seems to have been the surprisingly strong earnings report of Goldman Sachs last week. This is one of the major U.S. financial institutions that was so over-leveraged due to its gambling positions that it required U.S. government support (TARP) in order to simply survive in the past year. Sadly, their fast recovery seems to have emboldened their management with a sense of invincibility. It appears they are intent on returning the days of high risk strategies and high bonuses for senior executives - exactly the practices that triggered the international financial crisis of 2008. It appears the high rollers and speculators that burned so many investors in 2008, while surviving off the tax dollars gouged from the very people they burned, are intent on re-inflating the bubble. In my opinion, this strategy is destined to repeat the cycle of 2008, on a lesser scale only due to the number of folks that lost a lot of money, or are now taking a more conservative stance. On this Father's Day 2009, perhaps we're supposed to consider it reassuring that we got the equivalent of a paternalistic pat on the head this week from Prime Minister Harper on the subject of Employment Insurance specifically, and the economy in general. It didn't work for me. If Mr. Ignatieff wants to represent me, he should not have folded like a cheap tent on the questions that needed to be asked. EI reforms that might happen in 2010 are not helping with the problems today and of the past six months, where Mr. Ignatieff is supposed to be holding the government to account. Still, it appears both believe all is well in the economy, and it's time to take a long, paid, summer vacation. These are the questions that were sidestepped in the media sham (June 11) announced as the Economic Stimulus Report Card. 1) How much of the stimulus package money announced 5 months ago has actually reached the street? 2) How many infrastructure projects funded by the 2009 Budget have actually started work? 3) How many jobs have been created in Canada directly due to the 2009 Budget stimulus package? 4) Where have those jobs been created? The stated Budget target was the creation (or protection) of 190,000 jobs. Since January, the number of unemployed Canadians has increased every month but one (and I suspect the April figures were a complete anomoly at best). So, where are the jobs? "So let me be crystal clear. "A Conservative Government will not be raising taxes. "We will not impose a carbon tax. "We will not cancel planned tax reductions for business. "We will not be running a deficit. "We will keep our spending within our means. It is that simple." October 14, 2008 - $300 million dollars later, CPC gets another minority government in an election where the clear winner was 'did not vote'. November 27, 2008 - In their Economic Statement, [*sorry, this link appears to have succumbed to bitrot at cbc.ca: http://www.cbc.ca/canada/story/2008/11/27/question-period.htmlthe government repeats their delusion that they will not be running a deficit, ignores the global recession, makes no move to introduce stimulus funding for the Canadian economy, and takes a bully stance regarding funding of federal parties from the public purse based on votes received in the previous election. December 4, 2008 - Prime Minister Harper flinches in his game of House of Commons chicken, and plays his [website no longer exists: http://www.forgetthespin.com/archives2008/prorogue_Canadian_parliament.html"] prorogation card, avoiding certain defeat in the House on a confidence motion. January 27, 2009 - courtesy of the Governor-General, Harper, Flaherty and the CPC get their 'do-over' and deliver this turkey of a Budget a month after Christmas. Net result, 2 months wasted, $43 Billion in new economic stimulus now promised by a government committed to spending zero exactly 2 months earlier. Oh, and one other little thing - we'll have a $32,000,000,000 deficit in 2009/10. February 26 , 2009 - The Treasury Board says: "However, our unprecedented economic situation requires extraordinary measures if we are to help Canadian families, communities, and businesses weather the current economic storm. We need to get money to the people who need it as quickly as possible. "Starting April 1, following approval by Treasury Board, departments will be able to access this special fund (Vote) to start implementing their Economic Action Plan initiatives." This announcement is followed by two months of apparent inaction. May 1, 2009 - First day for processing of applications for funding for projects under the economic stimulus infrastructure package announced January 27, 2009. May 27, 2009 - The Guardian takes an initial look at progress on federal infrastructure stimulus projects [*broken link: http://www.theguardian.pe.ca/index.cfm?sid=254826&sc=101] announced 4 months earlier. Not much progress to report. May 31, 2009 - Prime Minister Harper announces a bailout to GM and Chrysler, two U.S.-owned firms, which will exceed $13,000,000,000. The announced justification for the bailout is to save jobs in Canada. However, the real function of the bucket of tax money is to fund a restructuring in Detroit which resulted in the closure of over 400 car dealerships in Canada, representing tens of thousands of Canadian jobs, and job cuts within the automakers themselves - continuing a long trend of receiving government funds while reducing job count. June 8, 2009 - Minister Flaherty redoes his sums, and [*deal link: http://www.theglobeandmail.com/news/national/flaherty-pegs-deficit-at-50-billion/article1152864/] announces the 2009/10 deficit will exceed $50,000,000,000. June 11, 2009 – Economic stimulus report card media event in Cambridge. June 13, 2009 - Finance Minister Flaherty announces he wants to stop stimulus spending. Just 2 days after government figures indicate less than 5% of stimulus spending announced almost 5 months ago has actually been spent, and leading economic indicators in Canada are still negative, the federal Conservative government is already musing about how to shut down the spending. June 16, 2009 - [*dead link: http://www.calgaryherald.com/Harper+Ignatieff+agree+study+reform+staving+summer+election/1705809/story.html] Harper and Ignatieff agree on Employment Insurance stall tactic selling out any Canadians who were pinning their hopes on a realistic adjustment to the insurance plan to help them out financially during the current downturn. Combined with April figures showing Canadian consumer spending was down, it's not encouraging news for economic recovery in the consumer sector in 2009. In 2008, we lost our wealth; in 2009, we're losing our jobs and income. Perhaps most Canadians really did not want another election this summer. However, there is no denying it would have created jobs. Short term, yes; but still paid work. Please, if you happen to see the PM during his summer vacation, ask him for me - where are the jobs? Clearly, Iggy doesn't want an election, and that's what mattered last week. If after the litany of events above, I was only tied with the CPC in polls, I would definitely want to find out what I'm doing wrong and fix it before an election, too. What should we call it when our leaders are trying to deceive us by claiming an economic recovery is already under way? I came up with 'decovery'. 1) How much money has made it from the federal coffers to workers? 3) Which economic indicators show that an economic recovery is under way in Canada? Without doing any substantive research, but just skimming headlines today, here are some current economic indicators being reported that suggest the much-heralded economic recovery is not under way. (that's enough, it's depressing even me). It seems like the only manufacturing industry that's growing in Canada is making announcements about future economic stimulus funding by various levels of government. Sadly, while these announcements might be cheering up Bay Street (along with oil prices rising in spite of a growing world-wide surplus of crude oil in storage), they are not creating jobs on Main Street. Maybe next year. As for those of us living on the back streets, the federal government is adamant that it won't it make easier to qualify for Employment Insurance benefits, or try to speed up the processing of claims. They're very proud of their recent cut to personal income taxes, but that's no comfort to those no longer earning an income due to the global economic downturn, and have no taxes payable to cut. The number of unemployed Canadians continues to rise as businesses suffer in the continuing downturn, and federal activity is not creating jobs today. It appears that Canadian businesses are not building up inventory of either feedstocks or finished product. Presumably that means they don't see a near-term recovery in purchases by their customer base. Summer employment for students is the worst it has been in years. Our federal government has dumped something between $10 and $20 billion dollars of our money on two car-makers that are going to continue to drop in value, without any guarantees as to rational changes in direction (like listening to consumers), but only increased focus on cutting costs, notably salaries and jobs in Canada. That's not a strategy that is going to grow the economy in the short term, but will deepen consumer concerns and the current recession. As for riding on the coat-tails of the U.S. economic stimulus package, it looks like 'Buy America' has shut that down. I trust you have all followed the Canadian federal government's proactive but presumably non-protectionist policy on this issue, and purchased some maple syrup. Some see a trivial increase in commitments to buy housing in the U.S. as a harbinger of global recovery, but ignore the fact that housing prices are still down 15% or more, so the aggregate value of the purchases is still down as we are in the high season for residential real estate sales. Finally, the rising Canadian dollar will likely speed the demise of more Canadian manufacturers that focus on the U.S. as a major export market, except of course, for the oil industry which is still stuck in the doldrums despite the rise in the spot price for crude because the volume of demand has cratered. Is it the perfect storm for Canadian workers (consumers) and small businesses? Canadian Economic Strategy - Made in America? The U.S. government has printed a lot of money in the past six months, and created a stimulus package that is putting money into the economy, despite what people may think when viewing rising unemployment numbers. Is it possible that the Canadian government has been counting on the U.S. recovery to spark the Canadian recovery, but not wanted to dirty its hands with actually priming the pump themselves in Canada? If so, it would explain the curious reversal by International Trade Minister Stockwell Day. A week ago, the Minister said we should not react to the U.S. Buy America provisions that are shutting Canadian companies out of U.S. contracts, in spite of NAFTA. This week, [sorry, Calgary Herald has removed this item from their web site "http://www.calgaryherald.com/Business/blasts+American+movement/1644743/story.html"] it appears he is completely on board with the plan of retaliatory measures and has co-opted the Federation of Canadian Municipalities proposal into a federal effort. However, Day closed his remarks by encouraging Canadians to buy more maple syrup to counter the effects of a European Union campaign to boycott the refined tree sap. Of course, if Canadians were actually getting jobs from the economic stimulus package or even their employment insurance entitlements, they might be better positioned to buy anything. Of course, Stockwell will want to ensure we're not buying any of that Made in the U.S.A. maple syrup. If we want Obama's attention, why not just suggest we'll pull our troops out of Afghanistan early, and let the U.S. clean up their own mess there? After all, in the same week we're suffering more trade discrimination from the U.S., they're also asking us to extend the stay of our troops in the region beyond our stated pull-out date. Obama needs to get this silliness back in the box, or we will end up building Janet Napolitano's wall along the 49th parallel. Of course, it would be a heck of an economic stimulus project! Meanwhile, over at Natural Resources Canada, Minister Lisa Raitt's plan to deal with medical radioisotope shortages is to encourage Canada to get out of the business and tell the U.S. to start making some. Emmmm, given we have this almost captive export market, the ability to make the isotopes at other small Canadian facilities (e.g., McMaster University's nuclear lab in Hamilton), and the U.S. hasn't gone into the business, wouldn't this be a good time to invest in the Canadian industry and maintain the existing export market? Or, perhaps the feds are too busy looking for a new scapegoat for the second NRU failure on their watch. Presumably, they can't fire Linda Keen again. Oops! This item is posted in my 2009 Federal Budget review running commentary page. Actually, this article is in the 2009 Federal Budget review running commentary page. Praise the Lord and pass the budget! On May 8th, 2009, U.S. Energy Secretary Dr. Steven Chu announced that in the next couple of years, the U.S. federal government is going to cut its funding for research on hydrogen fuel cells. Instead, they want to focus on battery-electric and electric-hybrid vehicle research, areas they believe might actually bear fruit in our lifetimes. Is it possible that this administration is actually going to base policy and budgets on facts, science, research, and sound economics? If so, that marks a sea change for federal policy making, and lobbyists are going to have to come up with a completely different game plan. This does not bode well for the Hydrogen Highways in California and British Columbia. Taxpayers should be breathing a sigh of relief, while supporters of the tax-supported hydrogen vehicle initiatives in Canada and the U.S. have reason to be nervous. In my view, this is not just a victory for taxpayers over a financial black hole; it may represent an opening salvo for sanity over bloated pork-barrel government budgets. Perhaps we'll even get to revisit the oxymoron of 'clean coal', and start requiring real improvements in vehicle fuel economy, instead of dual-fuel credits for fuels that simply are not available. Dare we hope for action on cleaning up electric generating stations, instead of finding ways to 'grandfather' in exemptions for expansions and rebuilds of old plants? Shark Warning! The Speculators are Back in the Oil Market! Forget the Bulls and the Bears! It’s the Sharks (speculators) you need to watch now! Today (Thursday, May 7th), the price of the June oil futures moved more than $3 during the day, to end essentially unchanged from the open price to the close. That’s a lot of volatility for a commodity that is moved in the millions of barrels a day – or about $255,000,000 for just the price swing during the day today. That follows a rise in oil spot prices (WTI Cushing) of about 23% in two and a half weeks (from $45.82 on Monday, April 20th on to $56.33 closing on Wednesday, May 6, 2009). The troubling thing about this price rise is that North American oil reserves actually increased during this period. Further, we know there is at least 100,000,000 barrels of crude currently sitting in tankers parked around the world by the contango speculators. There is no significant positive market news to support a dramatic rise in oil prices in recent days. In fact, the U.S. banks stress testing suggests there is still a long time horizon to a real recovery of the U.S. economy. So, unless you have the stomach for playing against the sharks in their home territory, it’s probably a good time to get out of the oil pool. If you expect to be buying oil or oil products in quantity over the next months and years, this is probably a very good time to be looking a long-term supply contracts at set prices, or other hedging alternatives. Personally, I think the days of bargain oil prices seen over the past eight months are over, and it’s time to start looking at alternatives again. Judging by the price of the Wind Index, photovoltaic input materials and natural gas in recent days, I think some serious money is already going in those directions. After almost 30 years of reliable service, Edmonton chose to accelerate its removal of the remaining fleet of electric trolleybuses. I was in Edmonton on the day in question, and composed a photo-essay on the subject. I can't help but think that the residents will come to regret this decision in years to come.